The estimated cost of your Solar Roof includes materials, installation, and the removal of your old roof. Taxes, permit fees and additional construction costs such as significant structural upgrades, gutter replacement, or skylight replacements are not included. The Solar Roof cost is based on estimated roof square footage for your home, provided by Google Project Sunroof where available, and the portion of your roof covered with solar tiles. The estimated cost of your Powerwall includes the battery, supporting hardware and installation cost. We recommend that every Solar Roof be installed with a Powerwall battery to enable you to use more of the solar power your roof produces and keep your home running during a grid outage. In states that do not have Net Energy Metering policies, we estimate and recommend a number of Powerwalls that will enable you to realize the full benefit of the energy your Solar Roof produces. The 30% Solar Investment Tax Credit applies to the cost of the solar tiles and associated solar energy equipment as well as the cost of the Powerwall batteries. To receive the full tax credit, you must have federal income tax liability that’s at least equal to the value of the tax credit. This credit may be carried over to future tax years. Additional state, local or utility solar incentives may apply but are not included in this calculation. The value of energy your Solar Roof produces may exceed the cost of the roof, earning you value over time. We recommend the portion of solar tiles for your roof that we estimate will produce enough electricity to cover your home energy usage. To customize your usage, enter your average monthly electric bill. If you choose to increase the portion of your roof covered with solar tiles, your home may generate more electricity than it needs. In this case, you may not realize the full value of energy your Solar Roof produces. Your entire roof is not eligible to be covered with solar tiles due to building regulations and obstructions. Recommended solar tile coverage is based on estimated eligible roof area for solar. Installations will start in June, beginning with California and rolling out to additional markets over time. When Solar Roof is rolled out in a particular market, Solar Roof customers will be installed based on when their order was placed. Installations performed by Tesla, Inc.’s wholly owned subsidiary SolarCity Corporation. CA CSLB 888104, MA HIC 168572/EL-1136MR. View our full list of contractor licenses online. Spray foam isn’t just used for insulation — it can also be used for insulating the roof. So if its restorable keep it. The flat roof of this 1984 Custom-designed house in Troon North was a good candidate for a polyurethane spray-foam roof around 1994 over an existing Built-up roof. 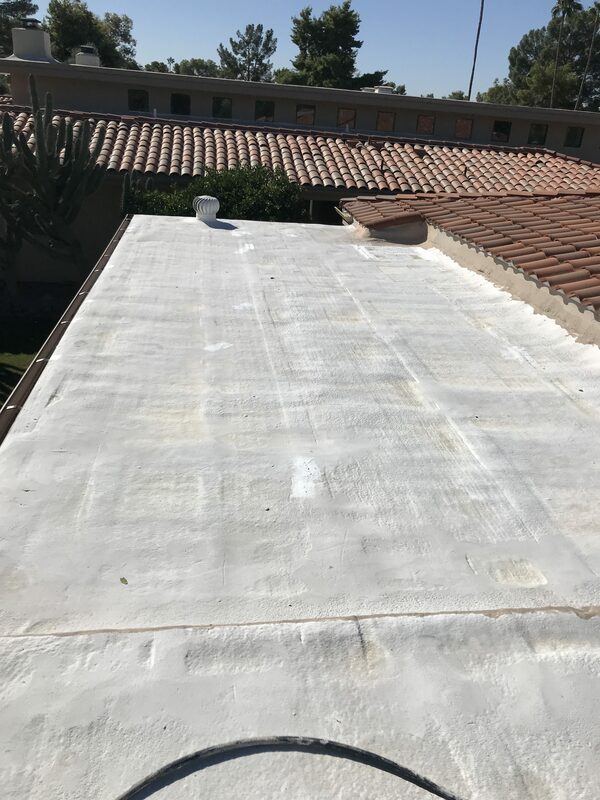 When our clientsl roof began leaking, the couple hoped to find a replacement roofing that would be energy-conserving, leakproof, cost-competitive, and reasonably green. As the house’s roof sheathing doubled as a finished ceiling, the old insulation was scant. They broiled in the summer and hemorrhaged money during the heating season. Insulating inside was out. The exposed underside of the 2×6 T&G roof deck was classic. Besides, the ceilings were just a shade above 8 ft. and the couple didn’t want to lose 4 in. to 6 in. of headroom to insulation. A spray-foam roof could be applied directly to the old roofing once it was prepped and cleaned up a bit. Not stripping the old roof and sending the debris to the landfill was also a big green plus. Besides, spraying-over would save the labor costs of stripping the old roof. Four inches of closed-cell polyurethane is a Class II water retarder, a semi-impermeable membrane that makes leaks all but impossible. As the foam expands and adheres aggressively, it would seal the many pipes and conduits running across the roof of a house with no cavity under the sheathing in which to hide pipes. Is spray foam roofing green? Not sending old roofing to the dump is a plus, as is the excellent R-value of SPF foam. (Sometimes it takes oil to save oil.) 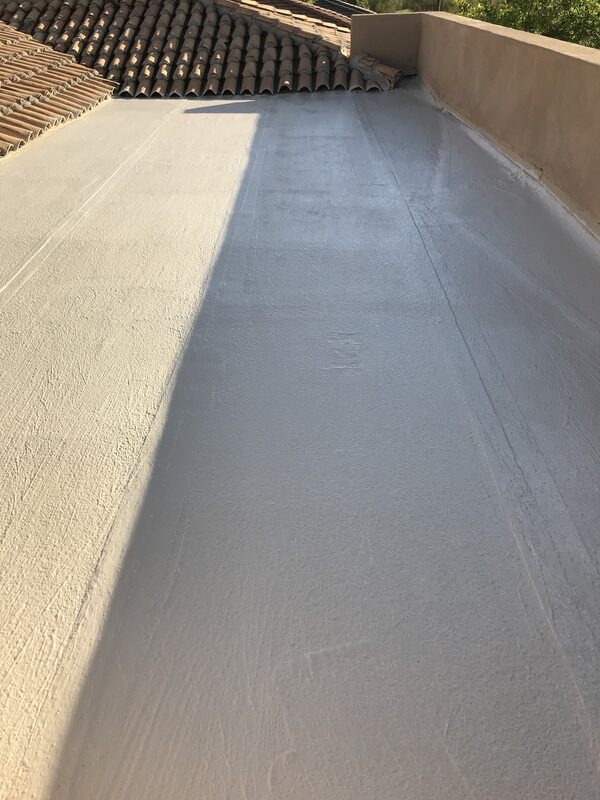 An SPF roof can also be quite durable when the polyurethane is sprayed with a special acrylic top coating that protects the foam against UV degradation. Lastly, the foam’s light color will reflect sunlight so, all in all, it should be a relative cool roof. With an addition a few years, but nothing was done to the old roof. There was about 100 blisters and the bird’s and the bee’s were tearing up the parapet walls in the old section. So we now did out Triangle Roofing Flat roof restoration. Repairing all the blisters, enhancing the drainage from the low-spot ponds and fixing all the bird and bee holes. 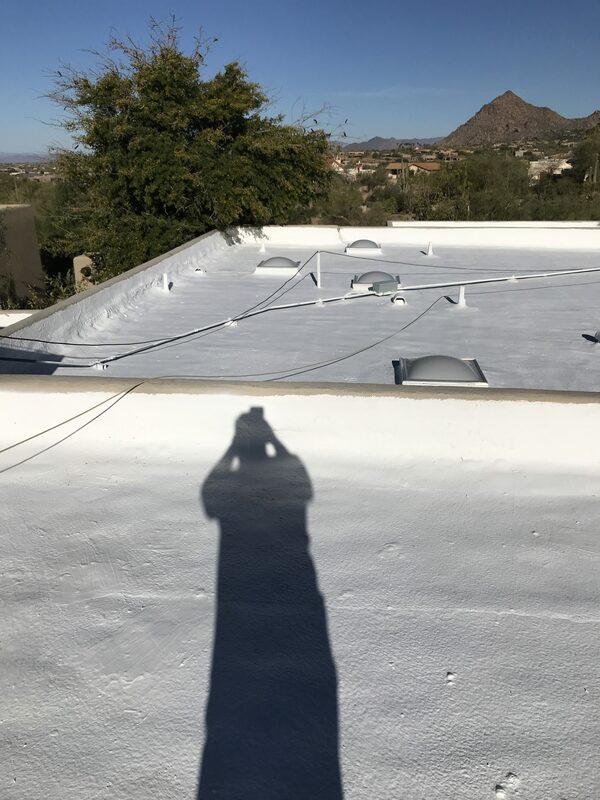 For your aging Grayhawk Roofing Scottsdale AZ. 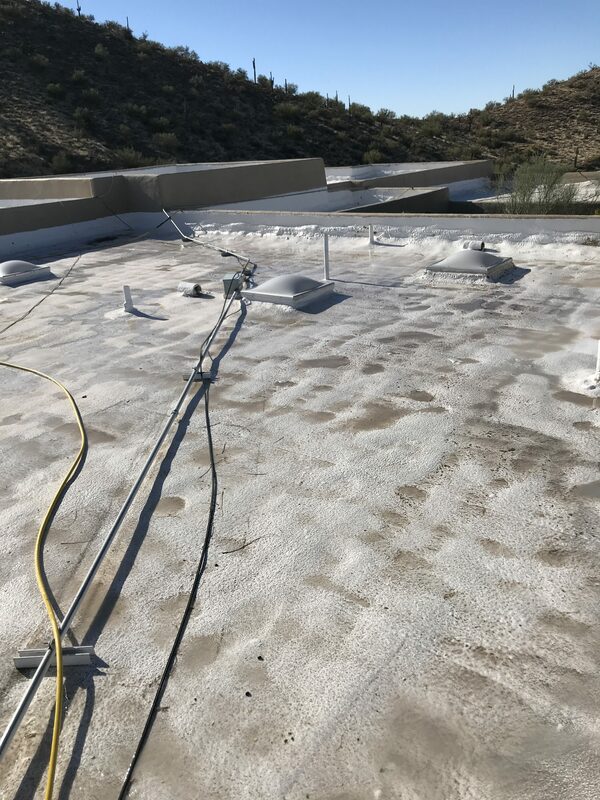 With Grayhawk Scottsdale Roofing Contractor there are numerous things you can do to prolong the life of a flat roof, and adding a coating is at the top of the list. 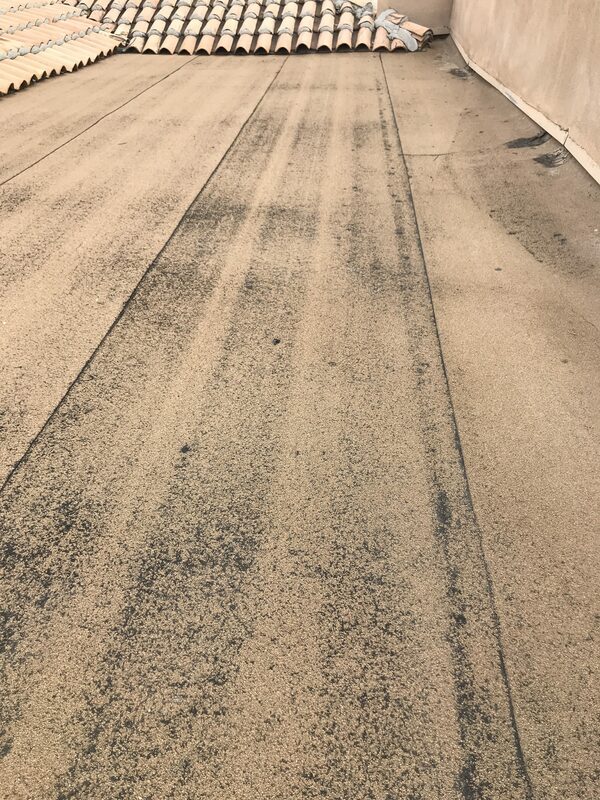 When properly applied, a roof coating can save your building from leaks, reduce stress on your HVAC system, improve the look of your building and best of all, save you money. However, not all Grayhawk Scottsdale Roofing Contractor are created equally. Some materials and products perform better than others in terms of durability, longevity and overall effectiveness. And of course, it all depends on how well your roofer applies it. Here at Triangle Roofing, we use a silicone coating, or “restoration membrane,” rather than an acrylic coating. We firmly believe in the superiority of this product, and our crew members are trained to apply it in accordance with absolute best practice. Standing Water – Traditional water-based coatings, like acrylics, cure as water evaporates after application. But, should water ever pool up on the roof for two days or more (which can definitely happen around here), the coating will start to return to its liquid state and separate from the roof substrate. Not good. Silicone coatings actually cure and become stronger in reaction to moisture (as long as the substrate was dry to begin with), further protecting your roof from the effects of standing water. While the specific Armor coating we use AC-60 is available in a variety of appealing colors, the white offering is regarded by the Cool Roof Rating Council for its highly reflective and emissive properties. By essentially shielding your building from the sun’s heat, this silicone coating can reduce energy use by as much as 35 percent. It’s also Energy Star rated and may contribute to LEED credit points. Additionally, because the product has ultra-low VOCs and is free of hydrocarbon solvents, it’s safer for the environment that other coatings. This specific Acrylic product can be used on almost any existing flat roof surface, including smooth Built-Up Roofing, granulated cap sheet, acrylic coating (as long as it’s well-adhered), metal (including sloped metal roofs), concrete, spray-on polyurethane foam, and various aged roofing membranes. The coating can be sprayed or rolled on just one day after a thorough pressure washing, and touched-up with a brush or roller. Also, because of its high solids content and absence of hydrocarbon solvents, this coating can be applied in excess of 25 mils in a single coat without blistering and still maintain maximum adhesion. This all makes applying the coating very simple and easy for your roof. First of all, looking for a copper roofing service provider capable of premium quality results? Triangle Roofing of Scottsdale Arizona is the right choice for you! 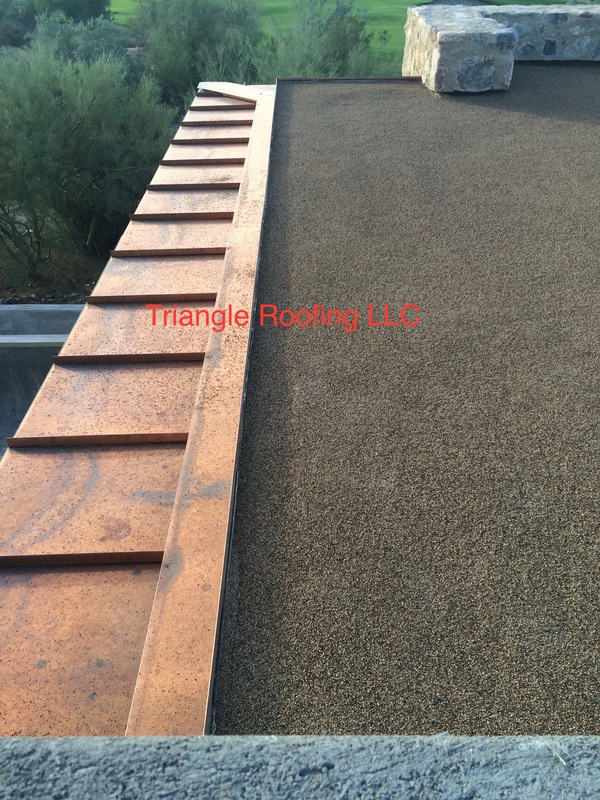 A licensed, Arizona roofing contractor, we fabricate and install elegant copper roofing for residential and commercial clients. We can claim an extensive portfolio of well-executed projects. We create customized copper installations fashioned according to the specific needs of your home or office. For beautiful, durable, and custom-built copper roofing solutions. contact Triangle Roofing today! As a result, Copper already has a natural resistance to corrosion, and is remarkably durable – even when compared to other metals. 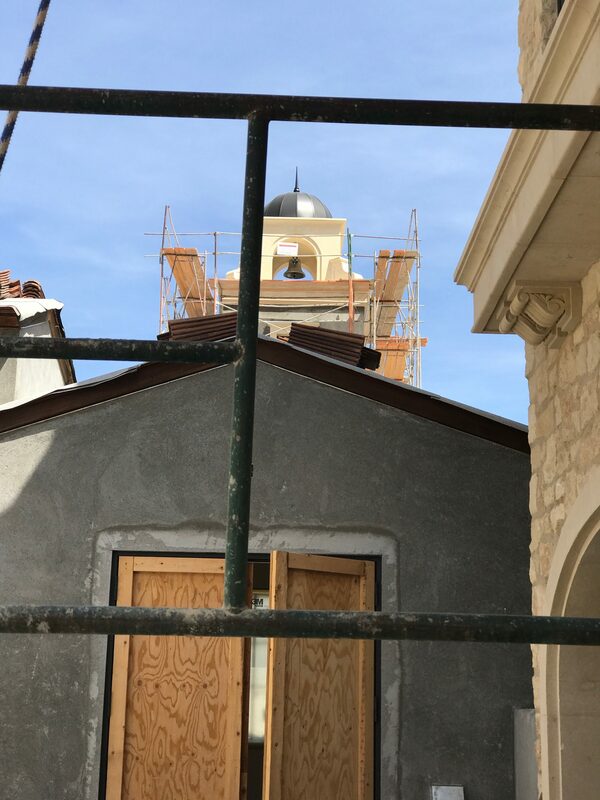 We combine this inherent durability with the skill and artisanship of our metalwork experts, and work to fashion a copper roof that can last for 50 to 70 years. With our copper roofs installed, your house or building can be protected from heat, rain, and other weather events for several decades to come. One of the advantages of copper is that it is malleable, yet it maintains its durability during and after shaping. Our team is composed of skilled metal craftsmen who can manipulate this fine material in a variety of ways. We can bend, cut, and bond it into whatever roof shape or pattern our customers prefer. With our customization capabilities, we can provide our customers with a finished product that they can truly call their own and be proud of. Although we always strive for elegant solutions, we never sacrifice safety and functionality in every job we do. Copper Roofing installation built for longevity, energy efficiency, and low maintenance. Most of all we’d like to think of every completed roofing project as a valuable, long-lasting investment for our customers. You, too, can reap the benefits of that investment. 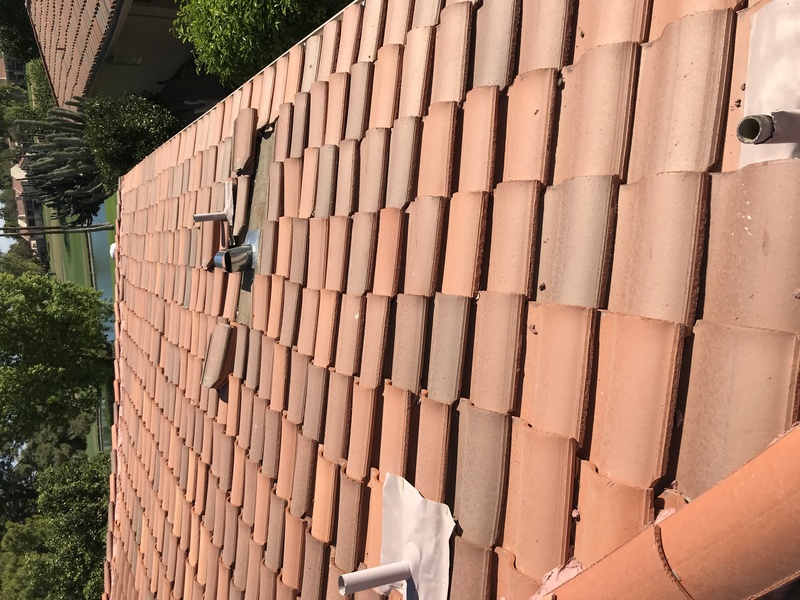 A Scottsdale Roofing Company solutions is the roofing solution for you, providing exceptional services with professional roofers. 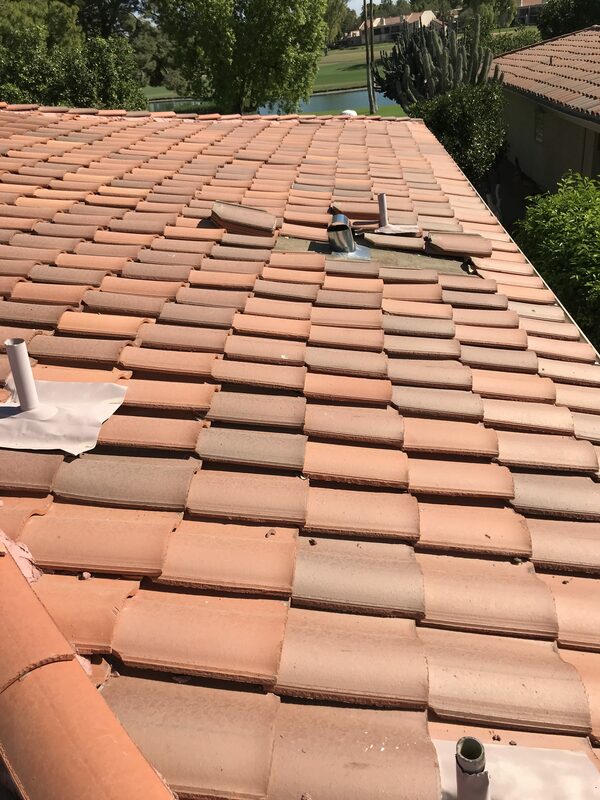 We are your neighborhood roofing and gutter specialist serving Scottsdale, Carefree, Cave Creek, Fountain Hills, Phoenix and Paradise Valley Arizona about protecting your home and family, or office and business, you should be thinking about Scottsdale Roofing Company Solutions. at Triangle Roofing LLC, we rise above the competition because quality matters, your time and money are priorities, and our expertise is guaranteed.